This week’s challenge is culture. I present you Nasi Kuning, a traditional food from Indonesia. Nasi Kuning (Indonesian for: “yellow rice”), or sometimes called Nasi Kunyit (Indonesian for: “turmeric rice”), is an Indonesian rice dish cooked with coconut milk and turmeric, hence the name nasi kuning (yellow rice). 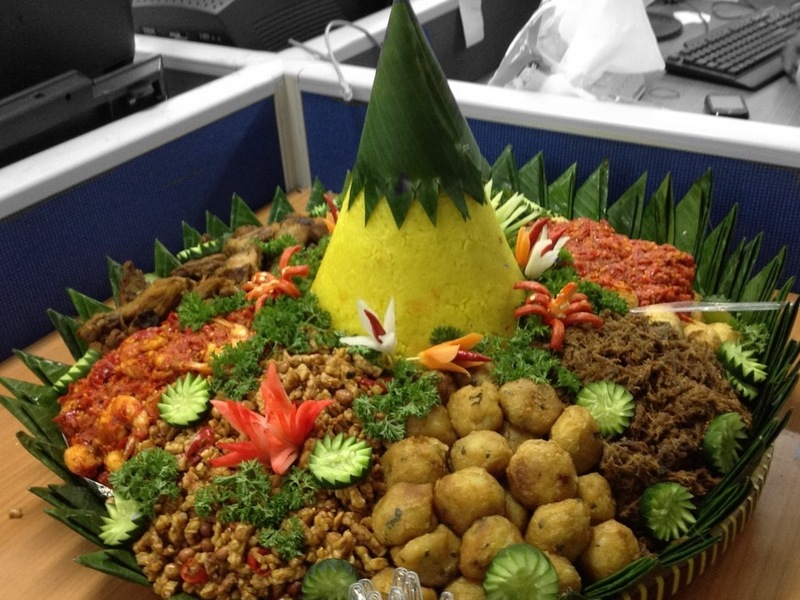 Nasi kuning might come in the form of a cone called a tumpeng and is usually eaten during special events. The rice looks like a pile of gold, so it is often served at parties and opening ceremonies as a symbol of good fortune, wealth and dignity. It is usually served with a variety of side dishes such as shredded omelette, serundeng (relish of grated coconut and spices), urap (vegetable in shredded coconut dressing), teri kacang (fried anchovy and peanuts), sambal goreng (fried tempeh and potato caramelized in spicy sauce), ayam goreng (Javanese-style fried chicken), balado udang (shrimp in chilli), or perkedel (potato fritters). More elaborate nasi kuning might include fried cow’s brain, fried cow’s lung, beef and seafood. It is common to serve nasi kuning with kerupuk udang (shrimp cracker) and a decoratively cut cucumber. The top of the tumpeng is customarily given to the most senior person in attendance. I miss Indonesian Food, especially the artful presentation of it. Thank you Annette.. Where and when did you come to Indonesia? Any posting about it? Yes, I was in Bali last year and started a travel memoir. You can find it under the category “Travel” on my blog. There are two instalments, a third one waiting in the wings…. Ping-balik: Weekly Photo Challenge: Culture – We (The Netherlands) have a new King | What's (in) the picture? Yang ini asli luar biasa enak. Buatan Ny. Hendrawan. Memang agak mahal, tapi semua elemennya enak.